Tara In Training: Good Morning! 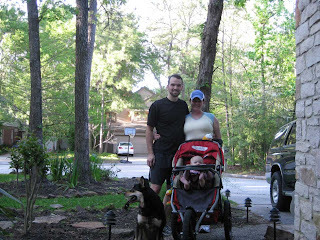 My husband Jeff and I have been running together in the evenings for the last 4 weeks. He's not a runner, although he's built like one, and is taking to it very well. We've decided to run the San Francisco Half Marathon on July 26th, which coincidentally is about half way through my Dublin training, so it will work out perfectly. Anyway, my point is that we normally round up the troops (Chula the cattle dog and Maddie in her running stroller) and head out for a nice run around 5 pm. 5 pm used to be nice! Now 5 pm is filled with mosquitoes and gnats and heat and humidity. So we're pushing our workouts to the morning, which so far appears to just have humidity. And cobwebs. This morning Jeff got up at 5:30, did his run with aforementioned cattle dog, came back, woke me up, and I did my 2 mile run while he got ready for work. Sweet little Maddie just slept away in her crib. She's still sleeping away, probably because she was awake intermittently between 2:30 am and 4 am. As was I. In short, this is going to be tiring, but exhilarating. There are few things that will get me up in the morning before my daughter wakes up, especially after she's been up throughout the night, and especially if I have to exercise!! I think of Maya and I think of Sig and the fight that cancer patients are putting up all over the world, and a few miles seems like nothing. What a good looking entourage!